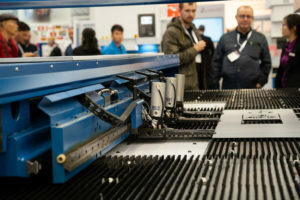 Eurob­lech 2018, the 25th Inter­na­tion­al Sheet Met­al Work­ing Tech­nol­o­gy Exhi­bi­tion, came to an end after four days on 26 Octo­ber. A total of 56,300 vis­i­tors from all over the world trav­elled to Hanover to pick up infor­ma­tion on and invest in inno­v­a­tive prod­ucts and dig­i­tal tech­nolo­gies for sheet met­al pro­cess­ing from 1,507 exhibitors from 40 coun­tries. “There was a great atmos­phere at the fair, among both the exhibitors and the vis­i­tors. 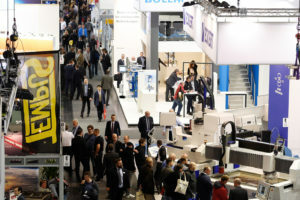 This year the major­i­ty of exhibitors used high­ly elab­o­rate stands to present their prod­ucts and ser­vices. They show­cased an enor­mous vari­ety of new machines and inno­v­a­tive solu­tions. Many of these inno­va­tions were demon­strat­ed live on the stands,” said Eve­lyn War­wick, Exhi­bi­tion Direc­tor of Eurob­lech, on behalf of the organ­is­er Mack Brooks Exhi­bi­tions. “We are delight­ed with the suc­cess of Eurob­lech 2018, which record­ed a con­sis­tent­ly high num­ber of vis­i­tors over the four days of the event from Tues­day to Fri­day com­pared with the pre­vi­ous event. There was a record net exhi­bi­tion area of 89,875 square metres and a con­sis­tent­ly high num­ber of vis­i­tors. This, of course, is due in part to the cur­rent boom in the indus­try, and many exhibitors report­ed increased sales,” con­clud­ed Eve­lyn War­wick. For­eign com­pa­nies account­ed for 58 per cent of the exhibitors. This rep­re­sents an increase of 4 per­cent­age points. An ini­tial analy­sis showed that the trade fair was once again very inter­na­tion­al, with 37 per cent of vis­i­tors com­ing from abroad. The main vis­i­tor coun­tries were Ger­many, Italy, Switzer­land, the Nether­lands, Spain, Turkey, India, the UK, Poland, Aus­tria and Bel­gium. 73 per cent of the vis­i­tors came from indus­try; oth­er impor­tant sec­tors includ­ed craft trades, trade and ser­vices. The most impor­tant indus­tri­al sec­tors from which vis­i­tors came were engi­neer­ing, steel and light met­al con­struc­tion, iron, sheet met­al and sheet met­al prod­ucts, the auto­mo­tive indus­try and its sup­pli­ers, elec­tri­cal engi­neer­ing, iron and steel pro­duc­tion, rolling mills, and heat­ing, ven­ti­la­tion and air-con­di­tion­ing tech­nol­o­gy. At 97 per cent, the pro­por­tion of trade vis­i­tors main­tained its usu­al high lev­el. The trade fair was once again a suc­cess with its audi­ence, that con­sist­ed large­ly of top man­age­ment with high lev­el deci­sion-mak­ing and pro­cure­ment author­i­ty. The pro­por­tion of vis­i­tors involved in pur­chas­ing deci­sions was 79 per cent, which was almost unchanged. Fur­ther infor­ma­tion on Eurob­lech, as well as the lat­est videos and pic­tures from the fair, can be found at www.euroblech.de. umati for everyone – How do I benefit and how can I get involved?